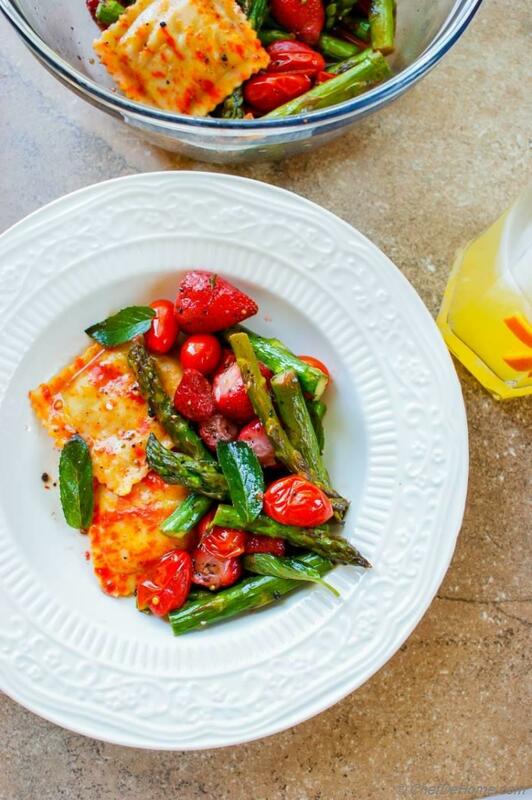 A delicious salad with oven roasted asparagus, roasted cherry tomatoes, strawberries with Ravioli Pasta dressed in lite orange dressing. I call it a "salad" but in my honest opinion it is a complete vegetarian meal. 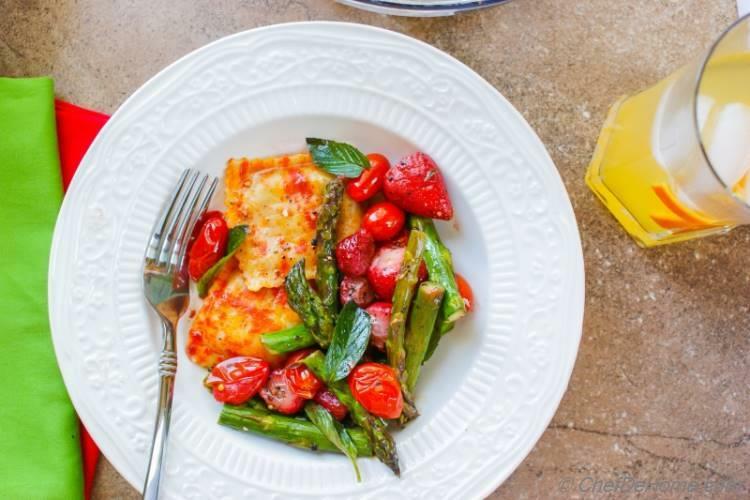 I mean, carbs from Ravioli pasta with roasted cherry tomatoes, asparagus, and juicy strawberries... creamy pumpkin filling of ravioli. Oh, and not to forget - pan-dressing with roasted vegetable drippings mixed in some orange juice! Isn't it a lite Pasta Meal? This salad is special dear to me since this is the one which pushed me into writing my first cookbook. Not just the colors of this gorgeous pasta salad but flavors were so spot-on that I could not resist to pen-down all of my salad recipes into a Salad Cookbook. I hold back for so long to share this recipe. I'm finally glad to publish it! Now you know what's cooking in the scrumptious book-cover of my cookbook?! That day, I was going to make Ravioli for lunch and I just got lucky :) that had no marinara/pesto in fridge and no tomatoes in-hand to make fresh sauce. A bunch of random ingredients.... few asparagus (my favorite), cherry tomatoes and some strawberries. So I roasted all the veggies and in few minutes... my favorite Pumpkin Ravioli Pasta turned into my favorite Ravioli Salad! If you have never tried roasted veggies and pasta before? I'm telling you, you are missing something!! 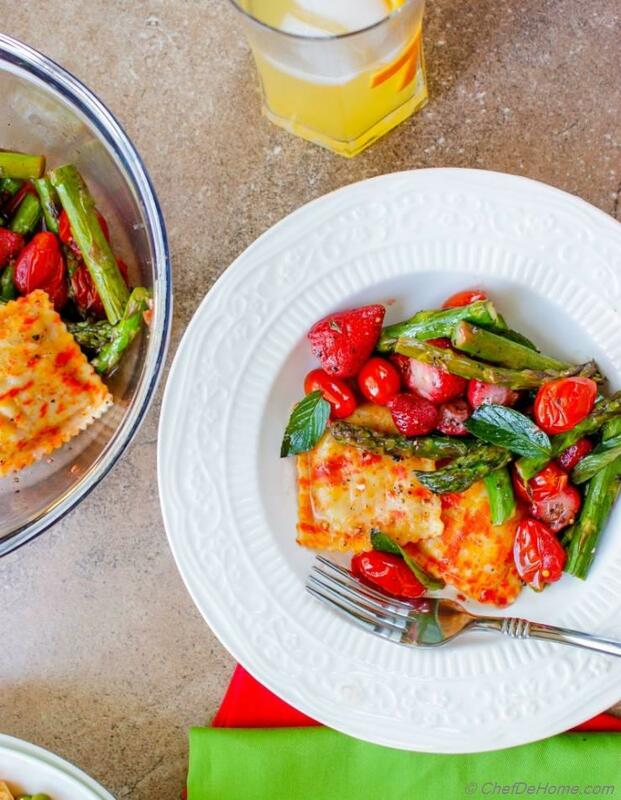 Also, asparagus, cherry tomatoes, and strawberries are real healthy and good stuff.... Plus a small batch of Pumpkin Ravioli (no cheese filling) makes it extra special yet does not break the calorie bank! Good for Healthy New Year! Isn't it? Just remember to buy veggie filled Ravioli such as pumpkin or squash ravoli instead of cheese Ravioli. It is a great recipe to keep in hand when you run out of pasta sauce. 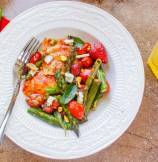 Roasted asparagus can be swapped with green beans and even broccoli. However, I recommend adding strawberries because strawberries provide sweet fruity acidity to this salad. So next time you run out of sauce to make Ravioli for lunch or dinner... Just roast veggies, and add some citrus to make a scrumptious pan-sauce a.k.a. salad dressing..... then mix in your favorite Ravioli pasta to serve a hearty yet healthy homemade meal. If you want to try all of my salad recipes. Follow this link and grab a copy today! Simply, never run out of salad recipes! 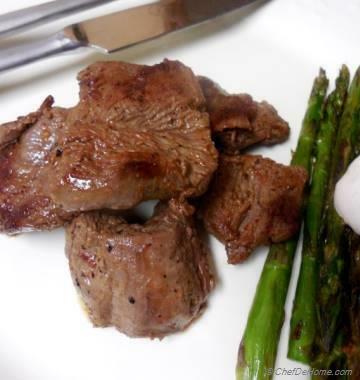 Total Time 30 minutes Prep Time 10 minutes Cook Time 20 minutes Difficulty Easy Yields 4 Servings Serves 4 Notes No. of servings depends on serving size. 1. Preheat the oven at 400 degrees Fahrenheit. 2. 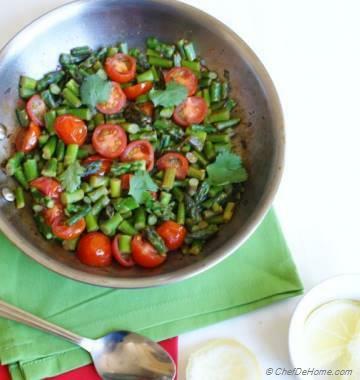 Bake asparagus and other Veggies: In a glass baking pan, add 2 inch long cut asparagus, cherry tomatoes and strawberries. Drizzle olive oil on the top and sprinkle with generous a pinch or two of salt and black pepper. Roast for 20-23 minutes, or until asparagus are slightly charred at edges and tomato's skin has started to burst. 3. Meantime, bring a pot of water to rolling boil. Add salt and cook ravioli according to package directions. 4. Once vegetables are roasted, add orange juice into glass pan to release any bits stuck at the bottom of pan. Transfer veggies and all liquid to a salad bowl. Add cooked ravioli and toss gently. Taste and adjust salt. Transfer to serving plates. Top with dots of blue cheese (if using), pepper flakes and fresh mint leaves. Serve and enjoy! 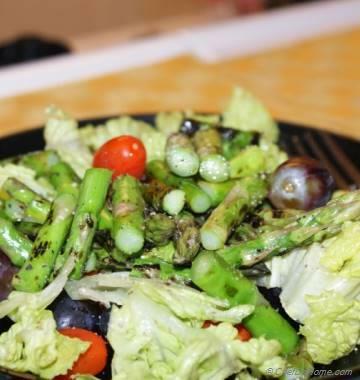 this is such a creative salad Savita, so glad you shared the one from your book! I need to try this, looks delicious! thanks, Manali! I have shared a lot of salads from book. Happy to see you like this one.